View full sizeExpress-Times Photo | BILL ADAMSJamie Remaley demonstrates the breathing treatments her children Radek, right, 3, and Peyton, 8 months, have to undergo daily. If there’s one thing Jamie and Shane Remaley have learned over the past three years, it’s to adapt. 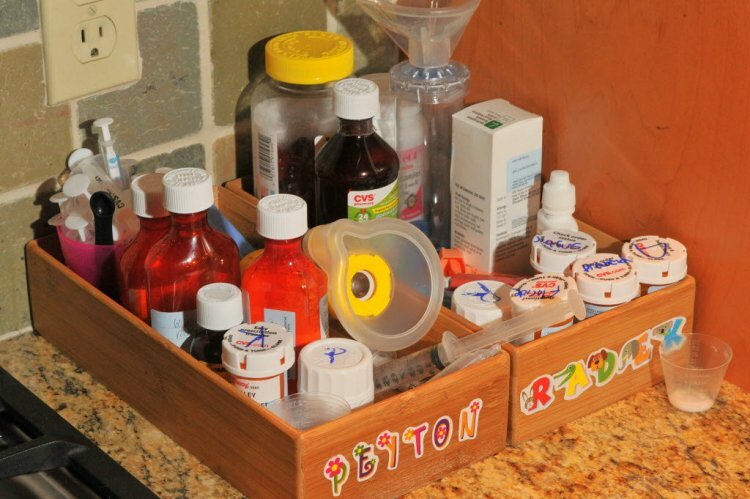 Kitchen cabinets and drawers that would normally contain food and utensils are loaded with medication and vitamins. A refrigerator that would bear magnets and grocery lists is covered with schedules for medication and feeding. And the liquor cabinet in their dining room is packed with feeding tubes, bags and other supplies. “When our children came around, they totally made us function in a different way,” said Shane Remaley, 37, of Upper Nazareth Township. Jamie Remaley, 29, and her husband had to adjust their lives when their son, Radek James Remaley, 3, was born with cystic fibrosis. Peyton Elizabeth Remaley, 9 months old, was born last summer with the same life-threatening, chronic disease of the lungs and digestive tract. For the past two years, the couple have raised funds for the Cystic Fibrosis Foundation, which supports education, care and research of the disease. They didn’t plan on fundraising this year because they have to care for their children, but they’ve had a change of heart. Jamie Remaley set a goal of $1,500, but exceeded that in three days. She now wants to raise $5,000. The 33rd annual Great Strides Allentown Walk kicks off May 12 at the Lehigh Parkway in Allentown. Registration begins 9:30 a.m. Walkers have the option to complete a 1.5- or 3-mile walk. This year’s goal is to raise $150,000, according to Cystic Fibrosis Foundation Development Director Mary Ann Sofronie. About 800 people, including 46 teams, are expected to participate. Last year, 588 walkers raised $136,000. The event has been a special part of the Remaleys’ lives for the past three years. The couple and its 30 or so team members raised about $25,000 last year through raffles and auctions. They raised $20,000 in 2010. View full sizeExpress-Times Photo | BILL ADAMSJust a sampling of the medications Radek and Peyton Remaley take each day. Jamie Remaley gave up her medical billing job to care for Radek after he was born. Shane works as general manager at Brown Daub Chrysler-Jeep-Dodge inLower Nazareth Township. Radek takes nine different medications, consumes 30 enzymes capsules and undergoes four breathing treatments per day. Peyton needs 12 medications, 19 enzymes and two breathing treatments per day. The breathing treatments loosen up mucous that could potentially clog the children’s lungs, and the enzymes are taken before snacks and meals to help digest food. Without constant care, the children could easily get sick, she said. Radek was hospitalized twice last year for lung infections. Just after Peyton was born, she spent six months and six days at Children’s Hospital of Philadelphia fighting for her life due to complications of the disease. Peyton’s hospitalization divided the family, even on the day of Jamie and Shane’s five-year wedding anniversary, but they persevered. “My husband and I make a great team,” Jamie Remaley said. She and her husband have always wanted three children, but the odds are against them. They’re carriers of the disease and doctors told the couple there’s a 25 percent chance any child they have could be born with it. She found out Radek would be born with it when she was 14 weeks into her pregnancy. Now the day-to-day routine is much more manageable, Jamie Remaley said. Peyton requires around-the-clock care and has to eat through a feeding tube, but she’s getting stronger each day. Radek enjoys playing with toy monster trucks and watching basketball and hockey. Cystic fibrosis is an inherited chronic disease that affects the lungs and digestive system of about 30,000 children and adults in the U.S., according to cff.org. A defective gene and its protein product cause the body to produce unusually thick, sticky mucus that clogs the lungs and leads to life-threatening lung infections. It also obstructs the pancreas and stops natural enzymes from helping the body break down and absorb food, according to the website.